Bar one mistake each He and Smalling did well i thought, it was the 2 around them who were shocking. Can he please just feck off as he’s becoming an embarrassment to himself! He's not good enough, I've said it over and over. I hope so too, but earlier he was gimping because he landed on his foot the wrong way and then his head exploded with blood. Just a typical day for him, I guess. He can actually pass the ball. Was a nasty gash that one. I generally don't crap on Jones as much as some others do, as I think that while he is not the quality we need, he does put his body on the line when he plays, and is not afraid to get hurt. Maybe that is why he is injured so much, he is probably the same in training as well. This post is embarrassing. He played very well today. Good game today. His desire and commitment can’t be questioned. He wasn't6 good or bad, he was ok, got his Terry Butcher on at the end there. I can never question his heart, he puts himself on the line but fecking hell Phil, use your brain more often. I wonder if Lindelöf was just rested today, or if there is a chance that Jones will start against Barcelona. Jones was good today, as he was in his last match, while Lindelöf of late has been under par. I think he was just rested. Its happened before this season. He was good again. He's a good defender. Decent on the ball but he was in the middle of almost everything West Ham did, from their goal that should have stood to their actual goal, and them forcing a wonder save from DDG. I thought he'd get wiser when he gets older. But man.. I wonder how well he can play as RB, thus Shaw can attack more? I’d rather he plays at RB and Dalot LB when Shaw is out, I trust him more than Rojo. Solid game, that run by Messi will be internet meme for a while but he battled throughout, and was probably our best player. Thought personally he didn't nearly do enough for the first goal, stood off Messi far too long. Not his fault but he is just out of his depth at that level. Made lots of strong challenges as usual but too passive and slow for both Messi's goals. Played really well and was really good with the ball again. Tried to drive forward and make something happen. 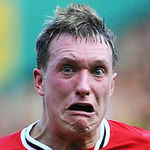 People talk about ball playing defenders and Phil Jones is one when he gets into form. Got destroyed once by Messi, but did well against him for the rest of the game. Hard to fully judge performances though since after 2-0 barca played for fun and it looked like we had given up. I would start with Jones against Everton. Although I expect Jones to be dropped and Young to start again. Had few good moments I thought, and didn't do anything crazy which is more than enough to praise him. He played next to Young which is not pleasant for anyone I reckon. Had his moment against Messi when he embarassed him though, and if we are harsh on him you can say he should close him down sooner for at least one goal. But that criticism is reserved for Smalling. He was probably the player in our side that looked most up for this level in this game. Maybe Pogba too. Not sure what he should do for messis goal really. Young gives the ball away and there is little time to react. Maybe try to stop him going one side and then Messi goes the other and you would blame him being too agressive. Best way to stop Messi is to attack him before he got the ball which we did early in the game. Indeed, if you see the replay from Jones angle, Messi just drops that shoulder so quickly, it’s basically his signature move before scoring in the bottom corner. Well what you don't do is give him space to run at you, which Jones did twice. Everyone in the stadium knew what was going to happen for the first goal but Jones stood off him and let him pick his spot. Like i say he had an ok game but hes simply not quite at the level we need. Overall ok but at the same time involved or uninvolved in most of their chances. He already got the space from Young giving the ball away and Fred not doing enough to stop him. After that both Jones and Smalling can't really rush at him. They try to cover the shoot and there is not much more they can do. Jones actually backed off him. Smalling hesitated but then tried to get out to him. It's Messi, he will probably score anyway, but a good defender makes it a bit harder for him. If they had gone after him people would complain about that though. When Messi gets time and space he will be hard to stop. Trying to press him then often don't work since he will just trick you. It is a brilliant goal. Did good, our MOTM i think and brought the ball out of defence very well. It's the Suarez run which unbalances both Jones and Smalling to give Messi the space. It's just top level football. The issue was Young making about 5 mistakes in 5 seconds to put them all in trouble. Messi scored two goals while Jones was around him. Yes it is Messi but we are in the mess just because our standard is that he played good game because he did nothing wrong. That goes for all other player. He runs, he fights, he does this and that. You know why Barca or City are one class above us? Because they raised their standards for players high. My post was about the game against West Ham. EDIT : But your point still stands imo. I gave him MOTM, the feckery was spread out for the 1st Messi goal but he had the mentality we needed and tried to bring the ball out with some intent. I don't thnk he was MotM at all - he made a small error for the first goal, and he was quite easily roasted by Messi 1v1. Yes, that happens to everyone, but when it happens more than once in a game you can't then be motm. He wasn't bad to be honest. At times he was the only one in midfield willing to drive the ball forward, which was weird. He's not really good enough to be at United, but most people know that by now anyway.